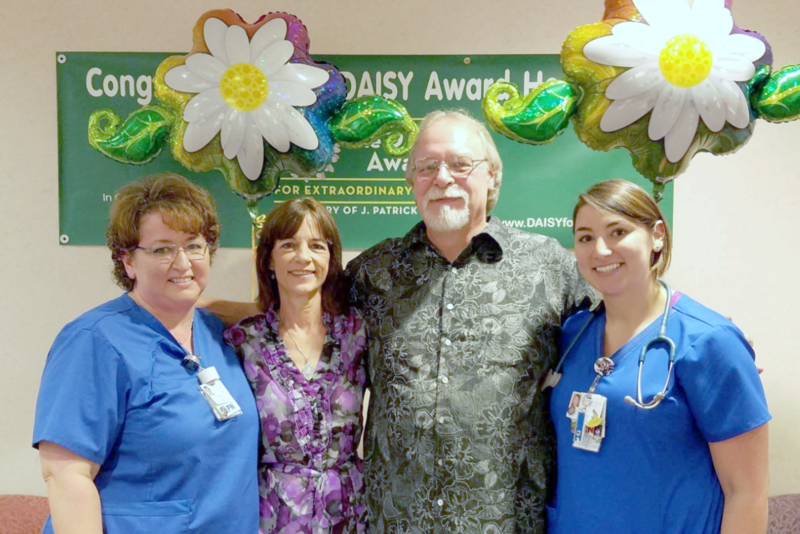 NRMC implemented the DAISY Award program to celebrate the skillful, compassionate care nurses provide every day. Anyone may thank a nurse by filling our a DAISY form and submitting it to the DAISY Coordinator. Forms are available at each nurses’ stations as well as NRMChospital.org. Following are Daisy honorees and their amazing stories. As an ER nurse, Heather Roberts is trained to respond quickly and appropriately during an emergency. She’s been at her patients’ bedsides during heart attacks, accidents, and serious illnesses. Yet despite the responsibilities and demands of her job, she always remembers that patients are often scared, confused, and in pain. It is at these times, that she manages to find a way to connect to her patients at the exact moments they need her most. Her kindness and warmth define her. This was certainly the case recently when an elderly person came into the Emergency Department experiencing a seizure. 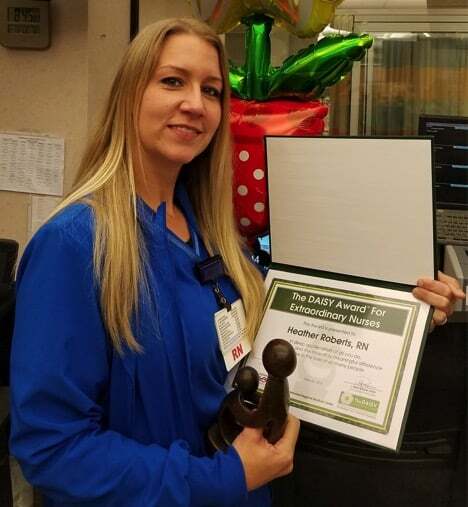 Heather went above and beyond to reassure her patient that she would take good care of her. She kept her as comfortable as possible and stayed close by. She explained the nursing care she was providing, talked with her about upcoming tests and procedures, and served as a patient advocate. 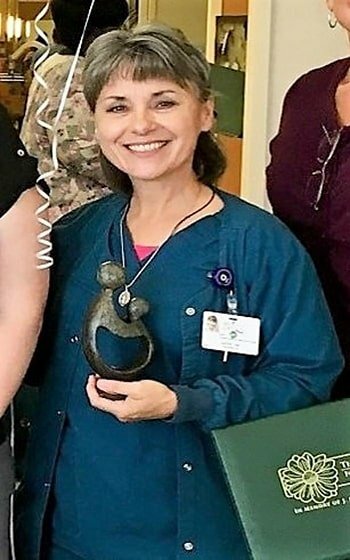 Because of Heather’s outstanding nursing care and remarkable kindness and compassion, the family nominated Heather for a DAISY award which she recently received during a special recognition ceremony in the Emergency Department. While at church, Mark Adkins collapsed in a room behind the altar. Within minutes, Alicia Watley, LPN & Hannah Watley, RN, were at his side and started CPR. They used an automated external defibrillator (AED) to send an electric shock to his heart to try to restore his heart rhythm. Others called for an ambulance, and Alicia and Hannah along with Dr. Marcus Stokes assisted EMS at the church and en route to Natchitoches Regional Medical Center. Once in the Emergency Room, doctors and nurses worked quickly to save his life. Once stabilized, the ER team transferred him to a facility with cardiac surgery capabilities. Thanks to the initial efforts of Alicia and Hannah as well as Dr. Stokes and the continuing care in NRMC’s ER, Mark had minimal damage to his heart. Alicia and Hannah recently visited Mark and his wife Lanie while he was in cardiac rehabilitation, and they were pleased to see his recovery. The DAISY Foundation was established by the family of J. Patrick Barnes after he died from complications of the autoFimmune disease ITP in 1999. During his hospitalization, they deeply appreciated the care and compassion shown to Patrick and his entire family. When he died, they felt compelled to say “thank you” to nurses in a very public way. Please say thank you by sharing your story of how a nurse made a difference you will never forget!